Cup of Coffee 7/3: It was a banner night for the system's top bats as Yoan Moncada and Andrew Benintendi led Portland to victory while Rafael Devers (pictured) reached base five times in a win for Salem. Greenville exploded for 12 runs as Michael Chavis and Kyri Washington homered behind a strong start by Roniel Raudes. Portland's Keith Couch and Salem's Anyelo LeClerc each turned in excellent outings on the mound as every affiliate except for Pawtucket won on a strong night throughout the system. Aaron Wilkerson started on the hill for the PawSox despite speculation that he would start in Boston this weekend. Wilkerson suffered from some spotty defense, and allowed seven runs (three earned) in seven innings of work, striking out five and walking one. Robby Scott followed him with a pair of clean innings to finish the game. The PawSox actually took an early lead in the second inning on an RBI single from Jantzen Witte which plated Chris Marrero. However, they did not score again until the eighth when Rusney Castillo crossed the plate on a groundout by Mike Miller. Castillo was the only player with multiple base knocks on a night where the PawSox only recorded six hits, going 2 for 3. The Sea Dogs lineup continues to make waves and Yoan Moncada and Andrew Benintendi were right in the middle of the action on Saturday night. Portland scored their first run in the third inning when Moncada led off the inning with a double then scored on a Benintendi groundout. The Sea Dogs scored two more in the fifth on solo homers by Danny Bethea and Benintendi. Moncada drove in a run with an RBI triple as part of a three-run sixth inning. On the night, Moncada went 2 for 4 with a double, a triple, and a walk while Benintendi was 2 for 3 with a triple, a homer, and a walk. Even with the heroics of Moncada and Benintendi, Keith Couch would not be outdone, as the right-hander turned in an excellent performance on the mound. Couch threw a complete game, allowing just one run on five hits while striking out seven and walking none. Salem jumped out to an early lead when Mike Meyers scored Wendell Rijo with a sacrifice fly in the first. The Red Sox continued to pile on in the third inning, scoring a pair of runs on a blast to center field by Rafael Devers. Devers was again in the middle of the action in the fifth inning, knocking a one-out triple and then scoring on a single by Meyers. Devers reached in all five of his plate appearances, going 3 for 3 with a double, triple, home run, and two walks. Anyelo LeClerc made a solid start for Salem, lasting five shutout innings and allowing just two hits and a walk while striking out four. Yankory Pimentel pitched three innings of relief, allowing two runs on four hits and a walk, while punching out four. Jamie Callahan recorded his first save of the year, pitching a perfect ninth inning and striking out two. The Drive crushed four home runs on a big night for Greenville's bats. The first blow came via a two-run blast from Kyri Washington in the first inning and then Michael Chavis was responsible for one more with a homer of his own in the fourth. Chavis was 2 for 3 with a homer, a walk, and two runs scored. Most of Greenville's damage came in a seven-run sixth inning. The Drive's final two runs came on solo home runs by Mitchell Gunsolus and Luis Alejandro Basabe in the eighth. Nicaraguan-born right-hander Roniel Raudes tossed six strong innings on the mound for the Drive, giving up a pair of runs on three hits and a walk, punching out seven. Jeffry Fernandez finished out the game with three innings of scoreless relief, allowing just a hit and striking out one batter. Daniel Gonzalez was fantastic through five innings for the Spinners on Saturday night, allowing just one hit and two walks while striking out six. Casey Janssen, whom the Red Sox signed to a minor league contract on June 15th, allowed a run in an inning and struck out two. Daniel Zandona pitched two scoreless innings of relief and Gerson Bautista earned his fifth save of the season with a shutout ninth. The Spinners grabbed an early lead when Roldani Baldwin scored Matt McLean with a sacrifice fly in the first inning. Lowell scored again in the third on an RBI double by Jerry Downs, scoring Jagger Rusconi. The Spinners did not score again until the eighth when Ryan Scott hit a two-run shot for his first professional home run. Yoan Aybar was 3 for 4 and raised his slash line to .320/.358/.440 in 13 games with Lowell. The GCL Red Sox rode a five-run fifth inning to a win on Saturday. Right fielder Juan Barriento was the offensive standout for the Red Sox, notching a two-run single in that fifth inning and going 3 for 4 with a double, a run, and three RBI in total. Lorenzo Cedrola was the only other player in the lineup with multiple hits, going 2 for 5. Max Watt started on the mound and went four innings, allowing two runs on five hits and two walks. Victor Garcia received the win, turning in five excellent innings of relief, allowing no runs while punching out five. The Red Sox earned a rain-soaked win on Saturday afternoon, scoring five times in the second inning before the game was called after five innings. Willis Figueroa and Carlos Pulido were the key cogs in that second inning rally as they each recorded a two-run single. Alejandro Rodriguez threw all five innings and earned the win, allowing just two hits and no runs or walks while striking out five. Yeison Coca scored the key run for the Red Sox, coming across the plate on an RBI forceout off the bat of Kleiber Rodriguez in the top of the eighth. First baseman Pedro Castellanos was 2 for 3 with a run, a double, and a walk. Ronaldo Pulgar was 2 for 4 with a run and an RBI. Jose Gonzalez threw the first three innings of the game, allowing a run on four hits and striking out four. Luis Rivero followed him with four innings, allowing a run on two hits and a walk. Warlyn Guzman and Joan Martinez each threw a scoreless frame to close out the game. 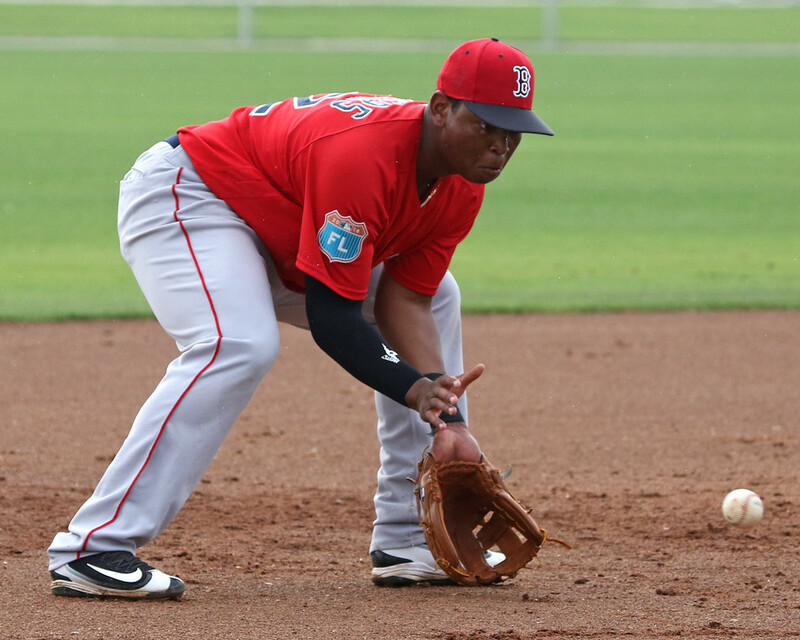 Player of the Night: Rafael Devers has had a tough season in Salem thus far, but he has shown signs of breaking out at the plate and turned in his best game of the season on Saturday night. Devers finished a single short of the cycle, going 3 for 3 with a double, triple, and home run while walking twice. The strong night brought his slash line up to .246/.313/.371 this season but he is coming off a much-improved June which saw him hit .313/.352/.386. The 19-year-old is coming into his own at a level where the average hitter is 21.7 years old, which bodes well for SoxProspects.com's fourth-ranked prospect.